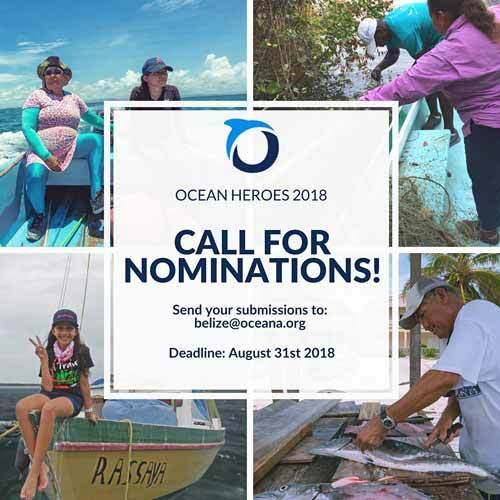 Oceana is pleased to announce nominations are now open for the 2018 Oceana Ocean Hero Award. This award recognizes and celebrates individuals who go above and beyond to ensure the protection of our oceans. Over the past seven years, Oceana in Belize has been proud to recognize several Belizeans for their contributions to the sustainable management and protection of our marine environment. Last year on Saturday, September 30th, Oceana recognized two Belizeans as Ocean Heroes 2017 for their selfless commitment to Belize’s marine environment, then eleven-year-old student and advocate, Madison Edwards (Madison Pearl) and career tour guide and conservation educator, Luz Hunter. Nominate your Ocean Hero today! Please include a brief summary of your reason(s) for nominating your candidate(s). Their impact can be local or national in scope. We will welcome the submission of nominees of all ages, although individuals nominating an Ocean Hero must be 13 years of age or older. After the nomination period, a group of finalists will be selected by a panel of local experts. Nominations are currently open to the public and will be taken until Friday, August 31st, 2018. Send your submissions to [email protected] today!